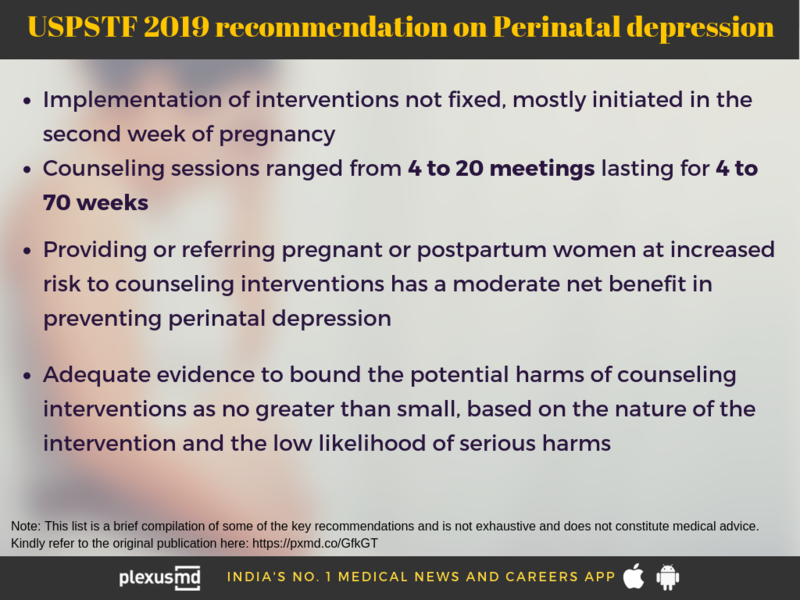 The U.S. Preventive Services Task Force (USPSTF) has released recommendation on interventions to prevent perinatal depression in pregnant or postpartum women or on their children. 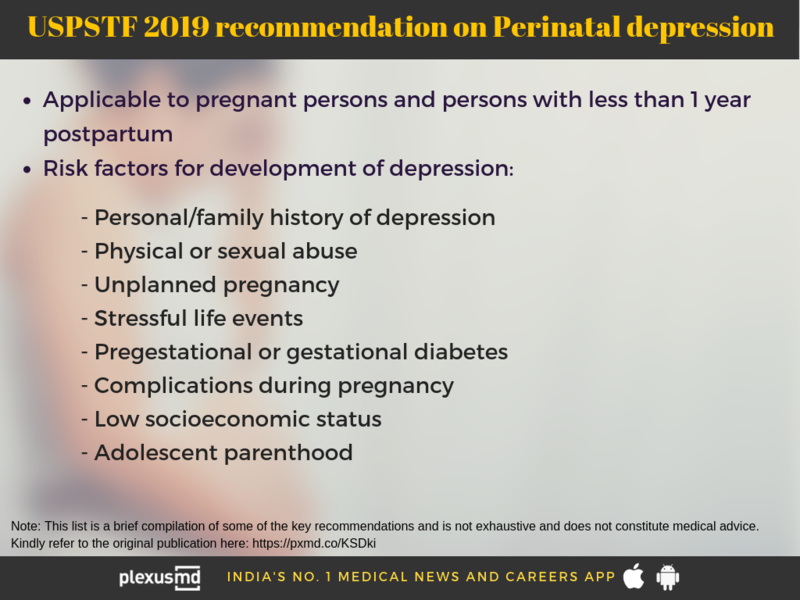 USPSTF has denoted 'B' grade to the recommendation, applicable to pregnant women and women with less than 1 year postpartum who do not have a current diagnosis of depression but are at increased risk of developing depression. - Counseling interventions to women with the history of depression, current depressive symptoms, certain socioeconomic risk factors such as low income or adolescent or single parenthood, or mental health-related factors. - Counseling interventions such as cognitive behavioral therapy and interpersonal therapy to affected patients. - Cognitive behavioral therapy focusing on positive changes in mood and behavior can be achieved by addressing and managing negative thoughts, beliefs, and attitudes and by increasing positive events and activities. - Interpersonal therapy focuses on treating interpersonal issues thought to contribute to the development or maintenance of psychological disorders. 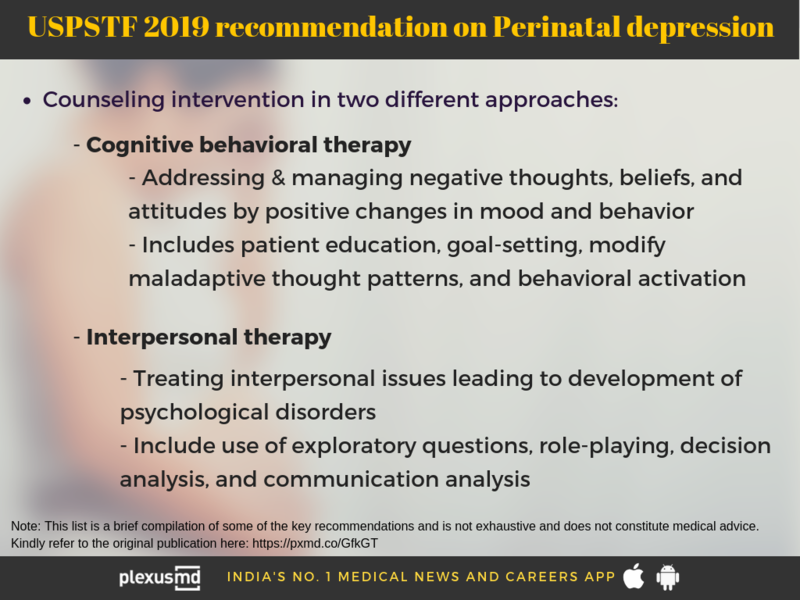 Labeled as one of the most common complications of pregnancy and the postpartum period, the key takeaway from the USPSTF recommendations is - Perinatal depression is treatable.